Thanks to Udon Entertainment for providing this early copy for review. 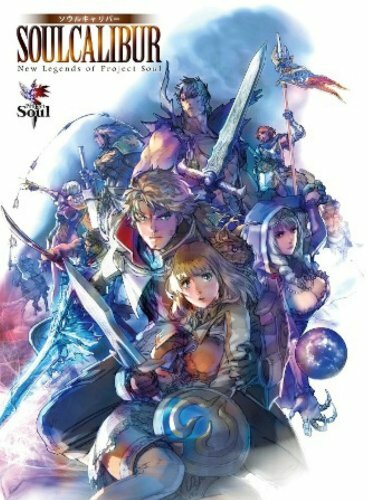 SoulCalibur: New Legends of Project Soul is actually the English translated edition of the Japanese artbook SOUL CALIBUR 設定資料集 New Legends of Project Soul released in 2012. I've already reviewed that Japanese book so this review is going to be similar. I've also used pictures from the same pages below. This is the video game artbook for Soul Calibur V, the weapon-based 3D fighting game developed by Project Soul. It's a large format 194-page paperback artbook that features character designs, profiles, background art, storyboards, interviews and commentary for the fighting game. It's great to be able to read the text, designer's notes, interviews, profiles and background in English. The painted characters designs and sketches look great. The costumes are like old school fantasy style with the armor and swords. They are detailed and varied. More than half the book are on the characters. The other half covers the world, environment art, storyboards and even more character sketches. The background art are mainly screenshots from the game. There are also some illustrations and sketches. They look great as well. Could be printed bigger because they are quite detailed. Nice companion for the game. Recommend to those who like character design or the game..